Newspaper layout templates do the work of organising various articles into place so that it becomes easy for the users to read it. They are available in the word format which makes the text inclusion process easy. 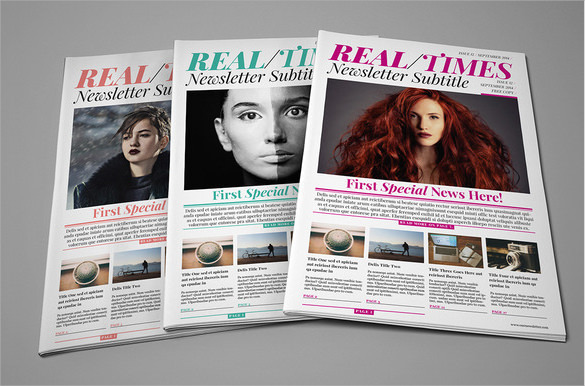 These layouts in Newspaper Templates are available in a lot of styles and that is the reason why you can download any of the packs in the internet. They are compatible to a lot of devices and is quite efficient for the users since they provide a stylish outlook to the design. They are totally editable and absolutely printable to be used for a number of fields. 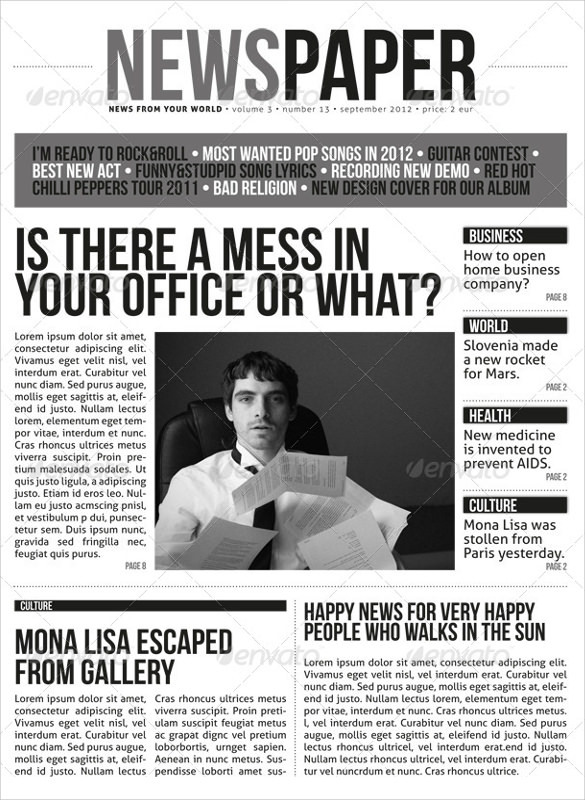 This is an attractively designed newspaper layout template available in PSD format. 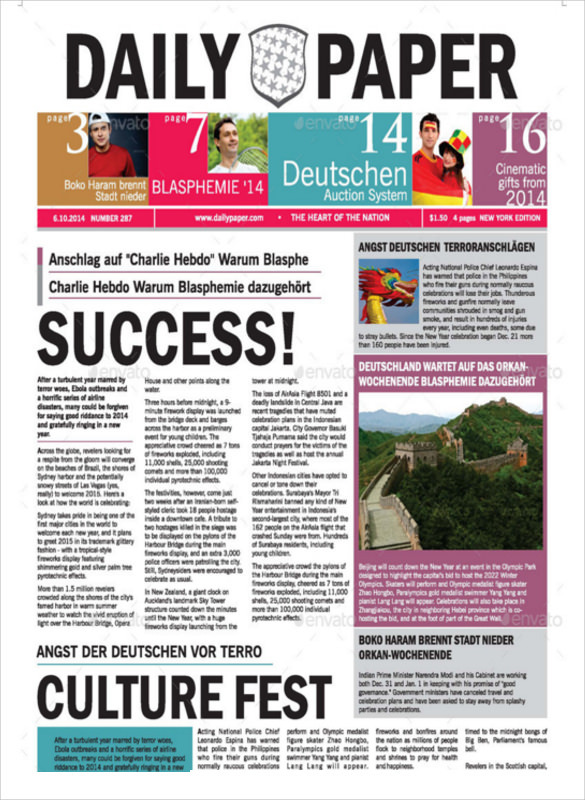 You can easily download it and use it to create a professional looking newspaper for personal or professional use. 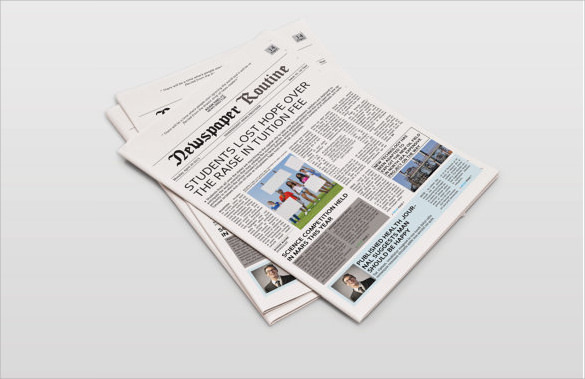 A good looking newspaper is sure to attract readers’ attention and encourage them to buy. This one is a colorful, boldly styled newspaper layout template that perfectly suits a newspaper related to economics, real estate, sight seeing, travel and other such subjects. If you are planning to create a dedicated newspaper for such topics, then this template will give you a professional looking newspaper layout for sure. If you are planning to design a newspaper in the style of a magazine, then this layout is the perfect platform to start with. Although it is a newspaper, you turn its pages as you would in a magazine. The only difference is that its pages are not bound together. This template is a perfect design for a sports related newspaper. With lots of graphics and spaces for images, this template allows you to showcase your sports content in a visual manner. There is some space in the footer to accommodate some less important news too. Why Do You Need a Newspaper Layout Template? 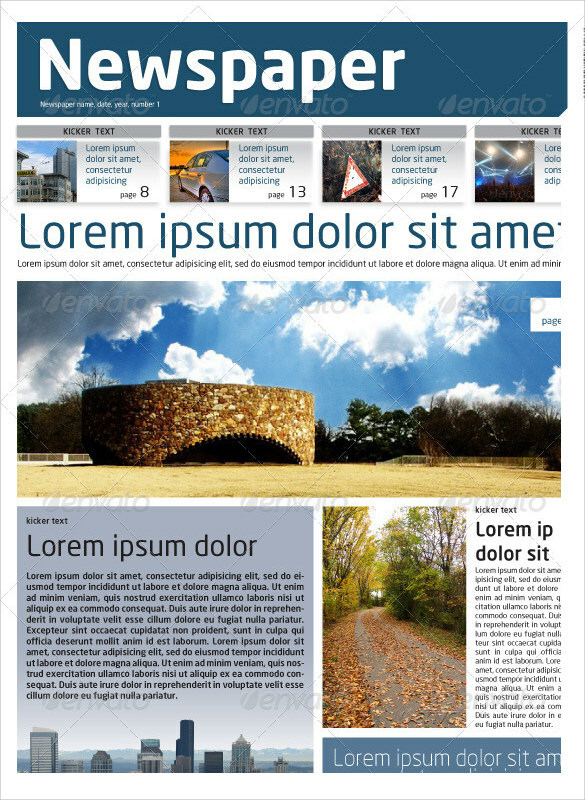 A newspaper layout template is needed to design a newspaper on your own. No matter how big your newspaper is and what subject it covers, you will definitely find a template that will perfectly suit the theme of your newspaper. If you are planning to start a new newspaper and are low on budget, then you definitely can’t afford hiring a professional designer to design your newspaper. You can spend some time looking for an appropriate newspaper template, and use it to create a professionally designed newspaper on your own. You may like Newspaper Ads Templates. When Do You Need a Newspaper Layout Template? You need a newspaper layout template when you are short on budget, but want to make a professional looking newspaper for your readers. You may also use these templates if the present news content does not fit into your existing newspaper layout, and you want to use your innovation and instill it into your work. So, if you want to create a newspaper but do not want to hire a professional designer, then download one of these templates to make a newspaper layout quickly and easily, that too for free. The most important benefit of using a newspaper layout template is that it allows you to create a newspaper on your own, without the need of hiring a professional designer. Thus, you can save money and also add a personalized touch to each and every page of your newspaper. All the parts of these templates are 100% customizable, so that you can re-design them as per your individual requirements and preferences. You can also see Newspaper Headline Templates. If you are planning to create a newspaper of your own, then these newspaper layout templates will definitely come to your help. All of them have been designed by professional experts, so that there is no scope for errors and shortcomings. Just download an appropriate template as per the theme of your newspaper, and get going.